Want to download free baby shower invitations? We know how busy you are and sometimes forget Where you found What (I know sometimes we do!) So, let us remind you about our site and all of our new Baby Shower Gift products and Baby Shower Planning ideas! Join our Sacco Bambino® VIP List. Periodically we feature brand new free printable baby shower invitations in our Sacco Bambino VIP Newsletter. Get access to our library designs for upcoming holidays, seasons & special events. These are one-of-kind artwork that you won't find anywhere else. We've come up with some adorable designs geared specifically towards awesome holidays, including Valentine's Day, Christmas, Halloween, Thanksgiving ... and even special events like Superbowl and Summer Splash baby shower invites! We also give our VIP members free access to past issues so you can find other awesome free baby shower design ideas for your upcoming baby shower! So, Subscribe Now ... It's Easy and it's Free! ... Keep In Touch! Download Your Hot Rod!, Camo Frogs and Barnyard Bambino Invites Here! Download free baby shower invitations of your choice. Your e-mail address is totally secure and will only be used in correspondence with unique-babyshower-gifts.com. Sign up for the Sacco Bambino VIP newsletter ... Keep In Touch! ... and receive access to our Free Baby Shower Invitation Designs! After you enter the information above, you will be directed to a download page and instructions about downloading and printing. 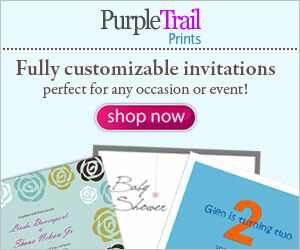 The pages are standard 8-1/2" X 11" and print 4 invitations per page. Looking for more free printable baby shower invitations? Subscribe to our newsletter and get All of our back issues to download free baby shower invitations from every past issue. Discover great seasonal and holiday free baby shower invitations you can print right now! Need The Perfect Size Envelope? Enjoy your free printable baby shower invitations and Happy Planning!